It was my birthday in may and as usual I couldn’t decide what I wanted, so I asked for a couple of PSN/SEN vouchers, looking on the PlayStation Store I found myself drawn to the PS+ page more out of curiosity rather then anything else. As I looked through the games on offer I thought to myself you have the credit and although there isn’t much you want that is available there might be in the future. A few weeks later at E3 the instant game collection was announced, seems I had joined at the perfect time. The great thing is you add them all to your cart and can download any time you wish, as long as you have a PlayStation Plus Subscription. Between June when the Instant Game Collection and today there has been 3 games changed every month the other free games have been. All of the above have been or are currently free to PS+ users in the UK, the value is well over the £39.99 that PlayStation Plus costs and with 3 more games each month is great value for money. Other features of PS+ include automatic update, which requires your system to be on standby constantly and will turn on and off to update, 1GB of online saves storage and discounts every week. Are you a PlayStation Plus user, have I missed anything above? Are you interested in becoming a PlayStation Plus user but but feel there is value to you, leave a comment below. Am I the only person who likes the new store? What do you think about the New Store, comment below. The number one enemy for any online gamers is lag, this seems to be the consensus between everyone. Casual gamers probably don’t mind lag as there casual gamers but for regular gamers its the bane of your night. Although its not the end of the world, it sometimes feels like it is. Your having a perfect game a few people join and within seconds the game is over and your team has lost. This happened to me last night while I was playing Ghost Recon Future Soldier with a friend. The thing is last night the problem was from the start to finish. We both seemed to be affected by it but I couldn’t help and think after the fourth host migration everyone must be feeling this. I soon thought I must be wrong watching the kill cam replays I was getting shot from two foot from either side and getting one shot killed. I constantly found myself chasing people with my silenced smg shooting them for a few seconds only for them to turn around and one shot kill me :-\ go figure. The majority of the players were American and I think this was the main problem as I’m in the UK, one guy seemed to be having the game of his life 30 kills to 3 deaths. I also found that most of the time a was running into the opposition and before i pulled the trigger i was dead and the kill cam showed me getting shot before going around the corner or even sometimes getting shot through cover. Ghost Recon Future Soldier like most multiplayer games uses a P2P multiplayer system so we are all connected via each others connections they will them implement a slow down to the host and each player individually so the speeds are matched accordingly. This system in my eyes has never worked and causes more problems then anything else. A triple A title should have its own servers so everyone is connected via a central hub and the latency constantly monitored and changed to make everyone’s connection equal. Doing this will stop most lag and keep all gamers happy. The reason it needs monitored is no one’s connection is 100% stable and if someone in the house starts watching YouTube video’s it will slow the connection causing lag but if it’s monitored and everyone else’s changed it should keep the game flowing smoothly. The other thing is localisation if I’m in the UK let me play with others in the UK or give me an option to only play with people in my local CoD MW2 had this option and I loved it as I never noticed much lag and if I did it was only for a few seconds which suited me fine. Does lag ruin your gaming nights, or do you think its a crap gamers excuse? Comment below. Well I’ve only had a couple of games on this and to be honest the first game I played I was disappointed but the second I actually had sone fun. The ßeta is only one map and one game mode called Hot spot the players attack and defend randomly selected locations on the Sarajevo Stadium in Bosnia. Firstly the menu seems slow and sluggish, this really does need improved but as it’s a ßeta its not a finished game it may be different in the full game. Graphics wise I was expecting MoH 2010 and it’s no where near as good, it’s graphically on par with most CoD games. The main in-game HUD is very busy and there is far too much information taking up too much of the screen, the ammo and map should/could be half the size, also the kill cycle takes up around 30% from the left of the screen and is very off putting. My first game was as I said above was disappointing, I’m not sure if it was due to my over expectations. After a few more games I thought this isn’t half bad, I unlocked 3 more classes/soldiers but unfortunately I spent a good 20 minutes trying to figure out how to use as I quit to the menu to try them, they were still showing locked. Don’t think I have any gun unlocks yet but as the menu is so non user friendly I’m unable to see what’s new :-\ although it does show I have something unlocked. It plays very well and is more fast paced then EA’s flagship game BF3, also as most people will say it’s got a more CoD like feel. I find the hip fire to be very poor and as it takes a while to ADS you sometimes get killed before you have time to aim. After a few rounds you soon get used to it and can choose when it’s best to fire from the hip or go for the ADS shots. It has the usual primary to secondary switch speed as most games. Although a few videos on YouTube say there’s no real physical problems like falling through maps or getting stuck I seem to have managed to find a few places where I got stuck. 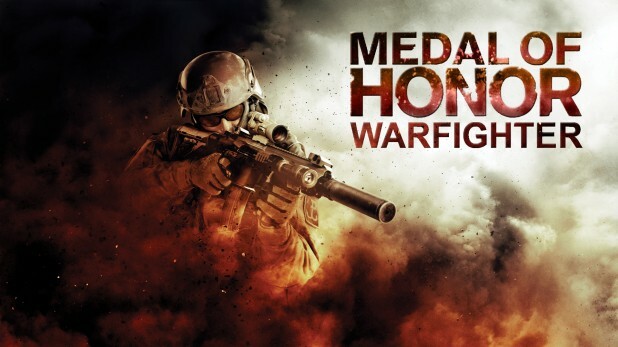 I found MoH 2010 to be similar in the way that at first it was hard to play and not very enjoyable but after a short amount of time playing it was easier and I found the game to be better to my then favourite Battlefield Bad Company 2. Have you had a chance to play? What’s your thoughts, please comment below. As a multi platform gamer its hard to get a good balance between consoles. As I tend to lean more towards the PlayStation these days I tend to spend more on games for that rather then my other consoles. My DS hasn’t been turned on for I don’t know how long and with the price of Vita games I only buy them now and again (not that there is much choice). I don’t tend to buy the same games for each console but I do make the odd exception. I have some life long friends who play xbox and if they want to play Coop or anything I will buy a second copy. That is where the confusion and forgetfulness kicks in, as an example I have Borderlands 2 on my Ps3 and 360 I play each whenever I have a chance and whenever my mates are on. The problem is I find myself doing missions I either haven’t unlocked or haven’t started but think I’m doing on the opposite console and I search my backpack and safe for weapons I have on the other console. To add to the frustration when you finally get into one quest you tend to do the same on the other console just you know what to expect and what weapons to take. This somewhat spoils the game and if your playing coop it starts to spoil it for the other players. Here’s hoping the next generation of consoles will be cross platform so ps4 and 720 players can play games together. I just keep thinking about pc gamers and the fact they can play the same games with different hardware against each other. Surely this is a possibility in this day and age for consoles too.